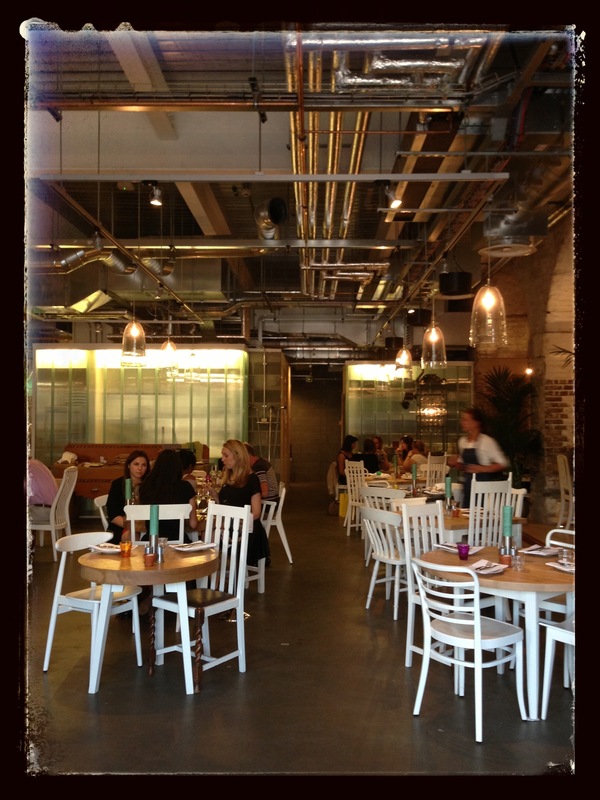 Home » ★★★☆☆ » Grain Store. I don’t like surprises. Grain Store. I don’t like surprises. You know when a new film comes out and even before you’ve read the reviews, somebody tells you that you’re going to love it and it’s the best film they have ever seen? That. I’d been looking forward to going to Grain Store for weeks. Lots of food people were saying great things about it – I remember the expression game-changer being used. And because it was so exciting and so new and so marvellous, I wanted to go with somebody who would really appreciate it, and when the very talented author of the blog Every Meal Matters suggested we go together, it just felt right. Arriving on a balmy summers evening, the coloured fountain was spectacular – such an archetypal London space. This is a cosier space than its neighbour, Caravan. With its bleached furniture and mismatched white chairs, it is a little less disused mill, a little more urban bistro notwithstanding it looks a little unfinished. We’d call that look shell and core in my world. We were placed right next to the kitchen. 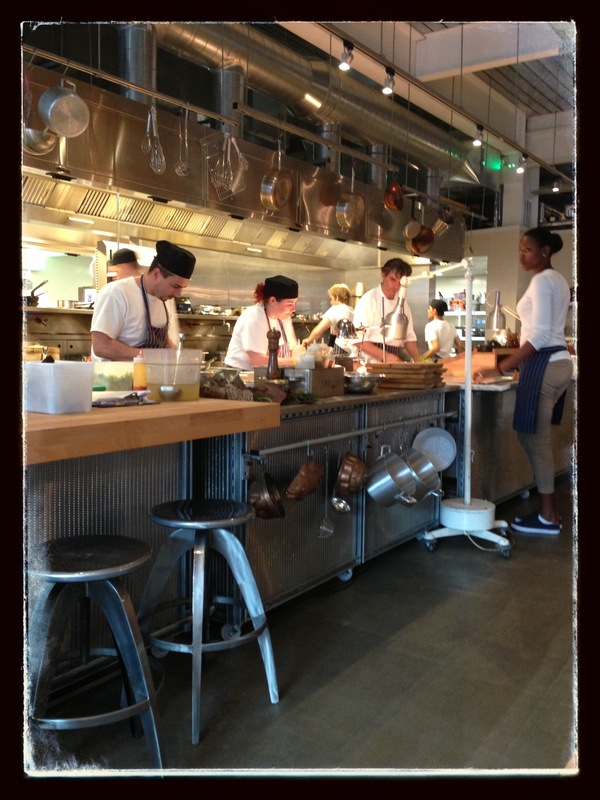 I’ve been to restaurants which show you what purports to be an open kitchen, but is really just a glorified food assembly area. Here it’s the real deal. And the great man himself was presiding over the show, not cooking as far as I could see – just conducting the orchestra that is a professional kitchen. Brave. I wouldn’t want my clients seeing me at work. They’d be shocked at the swearing. The unique wine list was where I got my first real indication that this was going to be very different from your run of the mill. Cocktails range from “Savoury”, which include pumpkin and maple syrup Bellini and butter & Hay champagne , to the somewhat surprising “Tony’s Greco-Roman wines”. My companion and namesake chose the fennel pollen vinus lupus. Lupus. It sounds like an illness. Indeed it is an illness. But not here. Containing said fennel pollen, clover honey, mastic, verjus, stirred with sauvignon blanc and gros manseng, this really tasted like sauvignon and honey. Not in a bad way either. Gros manseng. A white wine that sounds like a feminist insult. I’m going to try it out. Because I didn’t really like the sound of it but I had to try, I ordered the Roman smoked paprika white wine. This was a Grenache blanc, with smoked paprika cordial. It tasted like smoky white wine – no trace of the heat of paprika and not unpleasant, but not something I would venture to make at home. And because we were in the mood to be adventurous, we chose the Surprise Menu. I hate surprises. I hate not knowing what’s round the corner. I hate it when the phone rings with a number I don’t know. I hate it when the phone rings with a number I do know. I hate the phone. I hate it when someone says do you want the good news or the bad news. The fact that there is bad news means that there can’t then be good news. And because I am a control freak of the first order and surprises do not fill me with joy, I surprised myself by ordering the Surprise Menu. 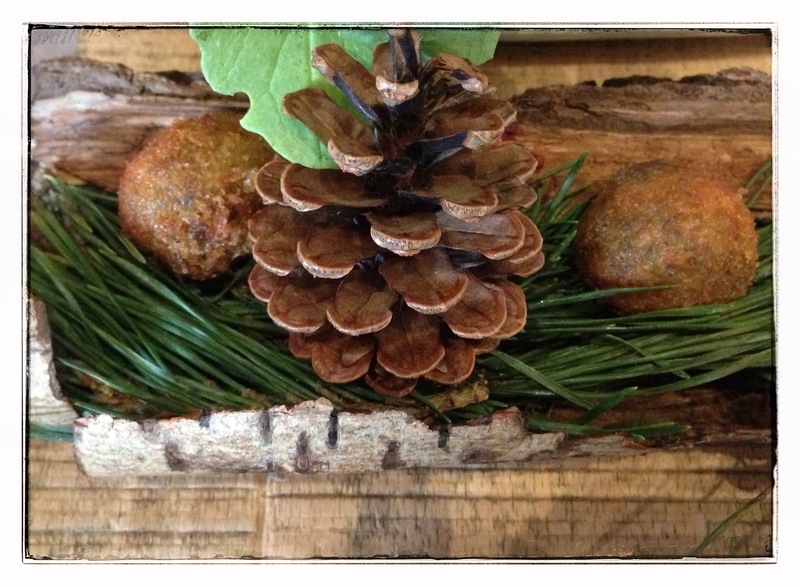 A chiselled-out log arrived, with pine needles and a deep-fried mushroom croquettes. Frankly, I could have eaten a dozen of these. The mushroom filling was rich, full of umami flavour – a little ball of intensity. I’m not sure the pine needles added anything other than decoration. 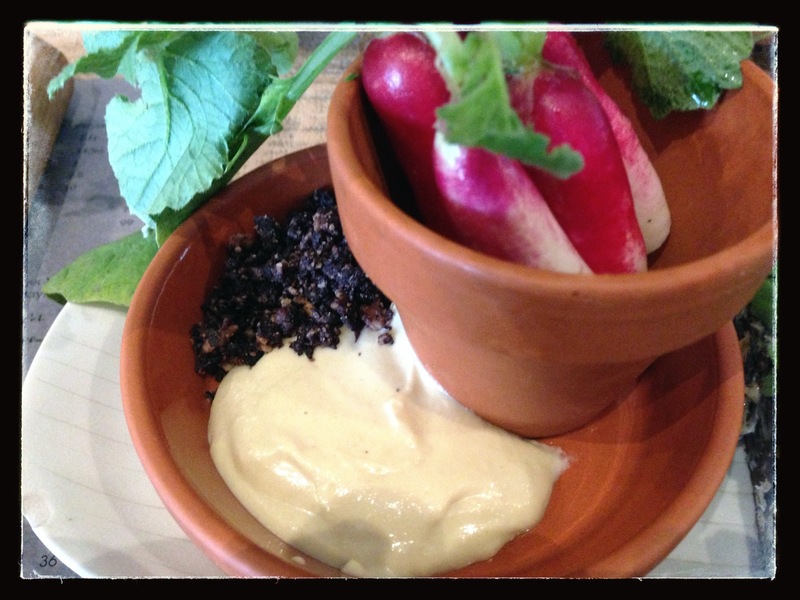 After that, radishes in a flower-pot with a cashew and yeast dip with olive “soil”. Very clever, but we couldn’t work out what the “soil” was made of – we could taste some sesame seeds and I see from looking at the menu that this was made of olives. You couldn’t really taste that. And there were apparently oyster leaves. Leaves that taste of oyster. But we didn’t know, because no-one told us. so we thought that they were just leaves. Which on one level they were. Interesting that, as a thing – if you know that a dish contains something, you look for it and taste it. If you don’t, you might miss it. As we did. Things can be too subtle sometimes. And part of the problem that we found was that those actually serving the food didn’t really understand what they were serving and didn’t explain it clearly. Even when asked. and it is food that does need to be explained. I do come from the food shouldn’t need that much explanation school, but here it actually does, because it isn’t obvious what it contains, when it comes as part of the “Surprise Menu”. I’d like to have known that the soil was made of olives. 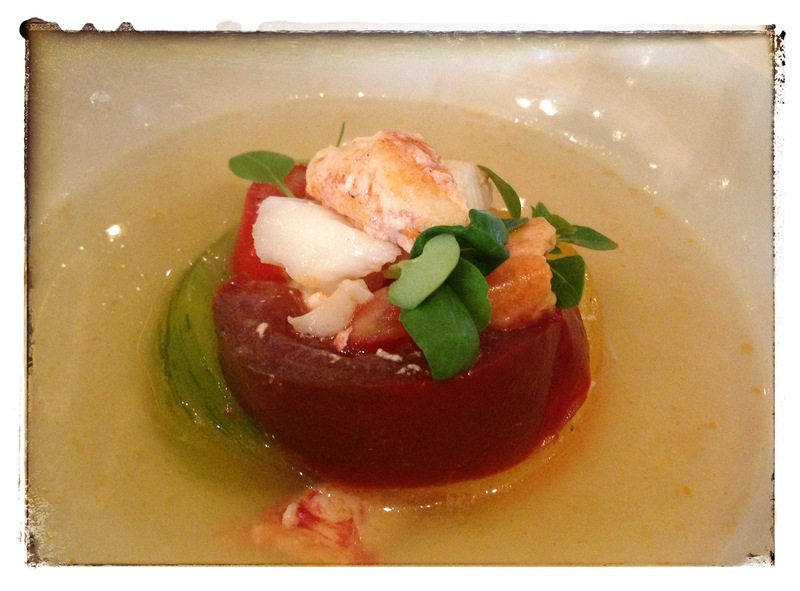 And then the lobster bloody Mary. My companion really liked this, but I have to confess I was a little disappointed. It looked beautiful and it was fresh and delicate but it was a little too undifferentiated and the tomato water didn’t knock me out. 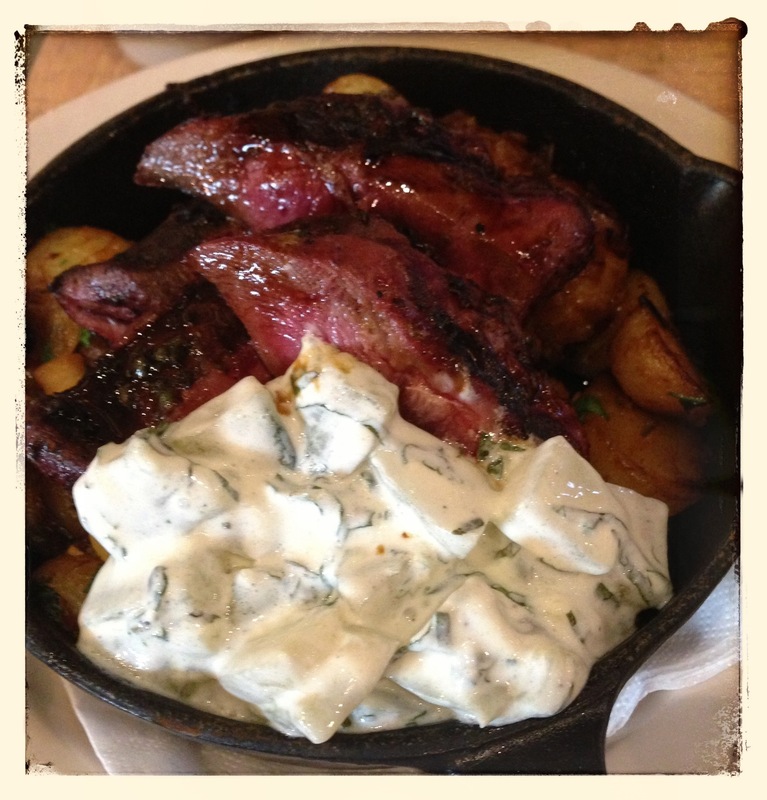 it was a little too insipid, when set against the other fairly punchy dishes. 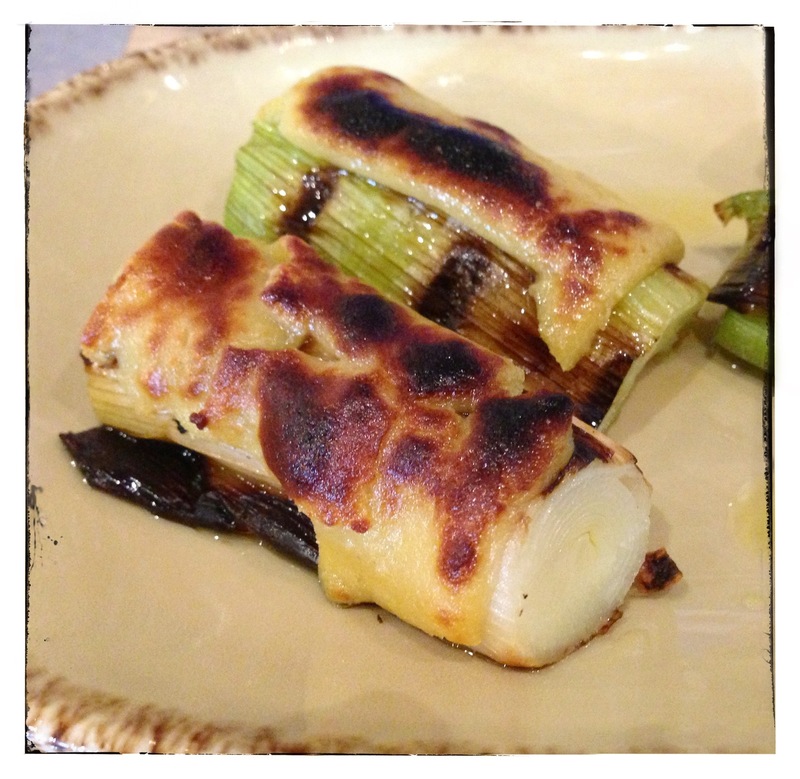 Then the leeks, with grilled cheese. A very simple dish but tasty and nicely done. 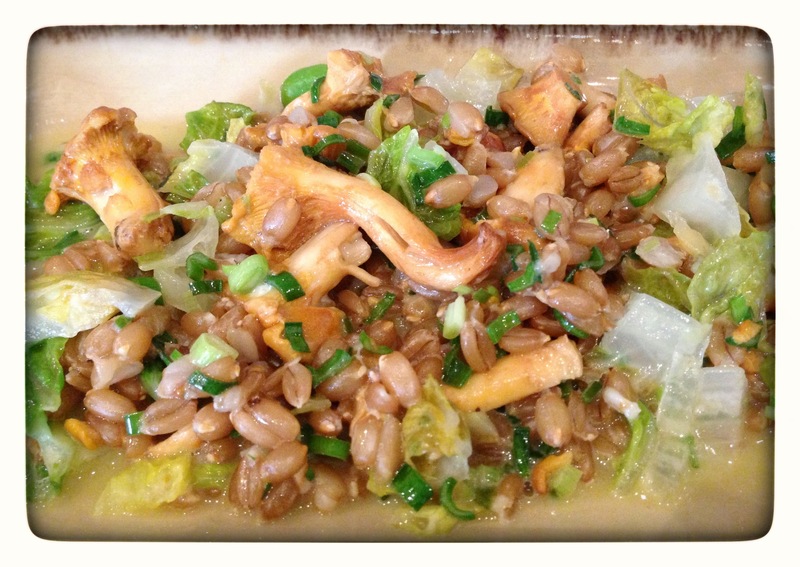 And then chanterelles, lettuce and spelt. This was delicious. A dish of roasted pigeon breast looked great but I don’t eat pigeon. That was entirely my fault for not checking what was on the Surprise Menu. But then the surprise would have been lost. The dessert wasn’t one I would have chosen either. Tapioca. It was perfectly well executed and tasty, but again, having to eat something I wouldn’t have chosen is my own punishment for letting someone choose for me. Can you sense a theme here? I see that this is a very interesting restaurant. I see that it wants to do something new and different , which I applaud. I see the novelty in letting the vegetables do the talking and I am very much in favour of that as a lapsed vegetarian. I can see the inventiveness in the combinations. I just wasn’t as blown away by it as I’d hoped to be, given the hype. And because I think it’s my own fault for allowing someone else to dictate my choices, I know that I would have enjoyed it much more if I’d ordered the things that actually appealed to me. Which is what I will do next time. No surprises please. Mushroom croquettes. Check out the pine needles. 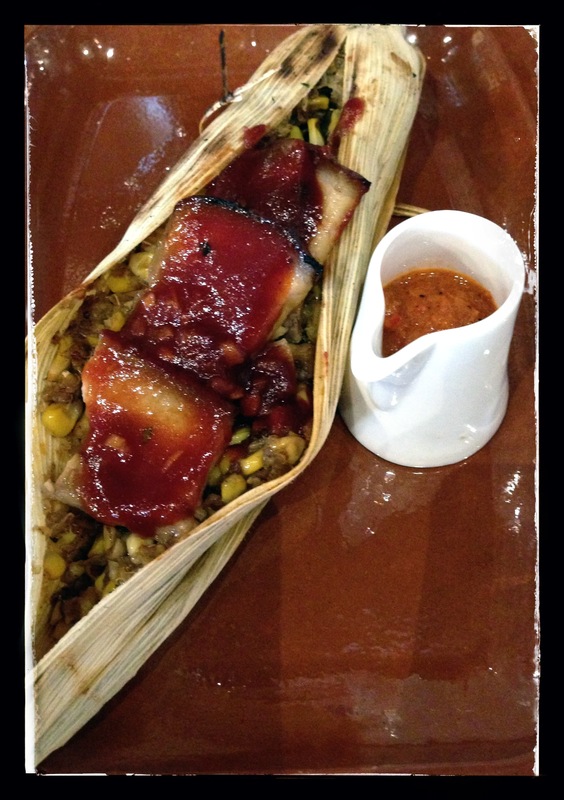 pork belly/quinoa and corn. Tomato sauce. Thank you; I work in the same building as the restaurant and I know there’s been a fuss about it, but your blog has actually expressed why. Also, you have been very calm about it, which is much easier to read as a non-foodie type. I’m much more tempted to try it out from your writing rather than the hype, probably because you’ve said that your experience wasn’t perfect, rather than in spite of that. Thank you! Thanks for that feedback. I would just stay away from the surprise menu !